Restaurant Brands, the owner of Burger King and Tim Hortons, has agreed to pay $1.8 billion in cash to acquire fried chicken chain Popeyes Louisiana Kitchen. 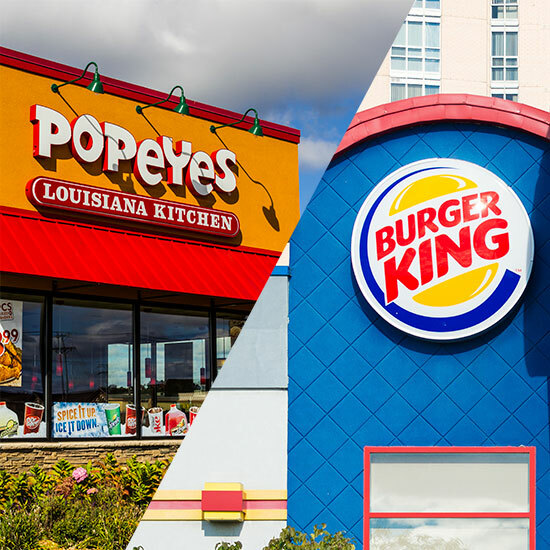 On Monday, the speculated tie-up was formally confirmed in a transaction that will bulk up Restaurant Brands to become an even bigger player in the quick-service restaurant segment. Restaurant Brands, with $24 billion in system-wide sales and over 20,000 restaurants, will add 2,688 Popeyes restaurants to the company’s portfolio with the deal. “We look forward to taking an already very strong brand and accelerating its pace of growth and opening new restaurants in the U.S. and around the world,” said Restaurant Brands CEO Daniel Schwartz in a statement. The purchase price of $79 per share is a 27% premium to Popeyes’ average stock performance in the 30 days of trading before media speculation began to swirl about a potential sale. The stock, which traded at around $66 apiece before the news was announced, jumped an additional 19% on the news. The transaction for Popeyes further remakes Restaurant Brands after an $11 billion blockbuster deal joined burger chain Burger King with Canada’s coffee-and-doughnut specialist Tim Hortons. The move by Restaurant Brands to bulk up with additional brands comes at a time when other restaurant chains have been pressured to off-load brands and narrow their focus on fewer concepts. Popeyes was founded in New Orleans in 1971 and has grown to become the world’s second-largest quick-service chicken concept based on number of units, trailing only Yum Brands’ yum KFC. Popeyes has reported sturdy growth in the U.S. and abroad, generating annual global same-store sales growth of 1.7% in the most recent year. The chain is also expanding, it opened 118 domestic and 98 international restaurants last year. The company’s menu features spicy chicken, chicken tenders, seafood and some regional items.